The island of Cozumel itself is not very big, but it still is called Mexico's largest island. On the island you can do lots of fun stuff like snorkeling and diving as the reefs there are amazing. You also can swim with dolphins or you can relax on the beautifull beaches. From the islands surrounding Isla Cozumel I would recommend visiting Passion Island which isn't very far away. 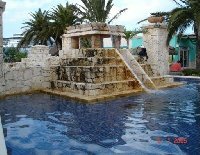 Maybe within 20 min by ferry you will reach the coast and Play del Carmen, or bit futher north, popular Cancun. From here it's just an hour by bus or car to visit the charming Mayan pyramids at Chichen Itza, in Yucatan. Food in Mexico is great too and not even just the Mexican cuisine but you will find all kinds of eateries and restaurants. Did you enjoy The beauty of Isla Cozumel and have you been on a holiday in Isla Cozumel, Mexico? Liked: The people, the nature, the culture. Disliked: Lots of cruise ships are coming there and sometimes the city is just overcrowded in the streets in day time.